Two adult test persons are used to determine the angle of inclination at which safe walking no longer occurs, when the pedestrian surface material being tested is subjected to a continuous stream of water containing a wetting agent. 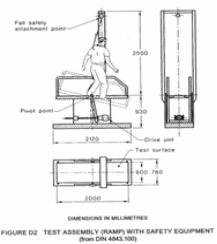 The test persons, each in turn, facing downhill and with an upright posture, move backwards and forwards over the test surface, as they increase their angle of inclination, until they reach their safe limit of walking. The angles of inclination obtained at such limits are used to assess the friction characteristics of the test surface.